What accessories do I need to start learning? If you are beginning to study a string instrument, there are some important accessories that you should have to make your playing better, your practicing easier, and your overall experience more enjoyable. I have created three lists to help you decide what you should spend your hard-earned money on. The first is a list of things that you must have when you begin. If you can’t buy these things, then you shouldn’t really be starting the instrument because you will have an uphill battle to get going correctly from the beginning. Many people start studying, encounter some problems, get frustrated, and quit. If you are going to invest time and money into this endeavor, you should give yourself a good chance at having success. The next list contains things you should have in order to make your learning go smoothly and keep your instrument in good shape. The final list is what you could buy if you want to have the best possible learning experience and if you have the extra money to put into it. 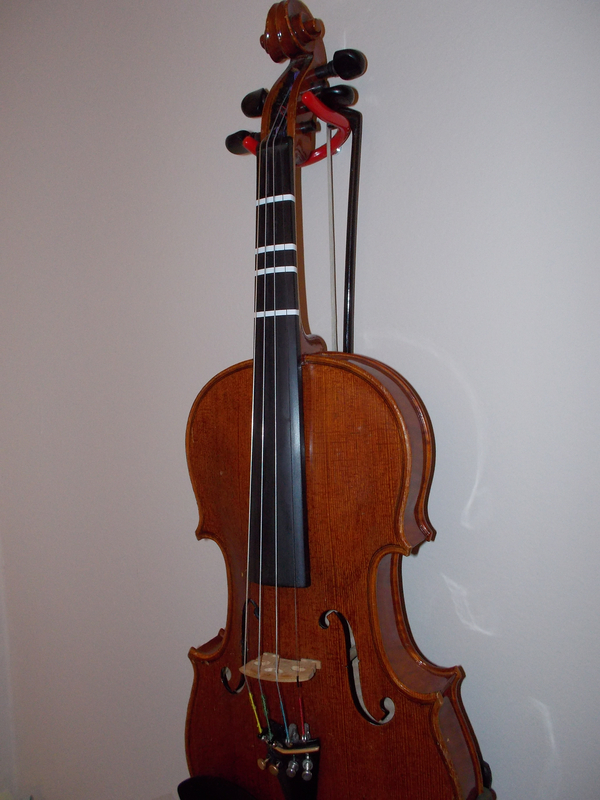 There are people who strongly reject the need for a shoulder rest, but my teaching experience has shown me that almost everyone has an easier time starting with a shoulder rest. Don’t practice with your music flat on a table. That will give you posture and technique problems. A music stand makes practicing far easier and more comfortable. Check with your teacher to see what his or her suggested books are. Essential Elements, Barbara Barber, and Suzuki books are my favorites to use with my students. You can get free metronome and tuner apps for smartphones and tablets, and there are websites like get-tuned.com you can use. Its also nice to have a tuner/metronome that you can put in your case though, so it is always available for your practicing. There are some that clip onto the instrument, which helps if you are tuning in a noisy area. Pencil, nail clippers, rag for wiping off rosin that has collected on the strings and instrument. Of course a teacher is not an accessory, but I thought it was important to put this on the “must” list. Almost everyone needs some one-on-one input from an expert teacher in order to progress at a reasonable pace. Strings break on occasion and its no fun to have to stop practicing until you can get to the music store. Have one in your practicing area for instant feedback on your posture, bow placement, and other techniques. Cheap bows are disposable. When the hair gets worn out, there’s no point in putting fresh hair in the bow because it costs as much as just buying a new bow. I suggest upgrading to a carbon fiber bow because they are very sturdy and better quality than what is usually included in a beginner package. Keeping the instrument from getting too dry is important if your local climate has low humidity during part of the year. Endpin stop or an endpin anchor. The small rubber tips on endpins usually aren’t good enough to keep your instrument from sliding around as you play. I suggest you buy an endpin anchor, which attaches to the leg of a chair or stool to securely hold the endpin in place and keeps it at the same distance all the time as well. I always bring my stool with me everywhere I play even if they have stools available. I am used to playing at a specific height and a specific angle, so even a slight change can throw my playing off a bit. If you move your bass around frequently, this is practically a must. Save yourself the backaches of carrying it around and just wheel it. The same goes for cello, though its less critical since it is far lighter. You want to remove every barrier to practicing you possibly can. If your instrument is packed away in its case, under the bed, or otherwise out of sight, its very easy to forget to practice or get too lazy to take the few minutes to get all set up. Having the instrument out on a stand (in a safe place in your house) makes it much easier to grab and start playing. I have my violin and guitar hanging on the wall behind my desk at all times and it takes me just seconds to grab them and start. If you live with other people who don’t appreciate your practicing as much as you (and lets face it, sometimes we have to practice things that sound pretty nasty) you may want a practice mute. It will cut the sound way down so others aren’t bothered and you can play with wild abandon instead of worrying what the people in the next room think of your playing. Some of my students are bothered by the feeling of the chin rest against their jaw. I first suggest putting a cloth over the chinrest, but sometimes that isn’t enough. A chinrest pad will make playing comfortable, which will likely lead to more practice and better results. It is very beneficial to have a way to listen to or watch yourself play. Watching a video or listening to a recording of yourself can lead you to valuable realizations about your playing. You will notice problem spots you were unaware of and often the problem will go away or at least get much better right away. I was unaware of how much tension I had in my face as I played until I watched a video of a performance. It was surprising and a little embarrassing to see the funny grimaces I was making. Needless to say, I made it my top priority to rid myself of all that tension and I fixed that problem quickly. The Zoom company makes many good digital recording devices as well as videocameras with high quality audio that are very helpful. What are so good types of violin strings I should start off with? So many out their it is hard to know what to get. I usually use Dominant strings, but with a Pirastro Gold E string. I also like Helicore to save a little money. Which instrument do you play, violin? The best decision I ever made as a beginner was buying a CodaBow. It was essential for me to know that any deficiency in my bowing was due to my technique, not to having a poor quality bow, and as a rank beginner, I could not trust myself to evaluate a bow. Numerous reviews said that the CodaBows (and carbon fiber bows in general) were of consistent, good quality. My second best investment was a cake of Jade rosin. There are doubtlessly other high quality rosins on the market, but the step up from a low quality rosin of the kind that comes with a beginner’s instrument makes a surprising Improvement. Helicore strings instead of the bargain basement brand also made a big difference. JD, Thanks for your input on the equipment that helped you! As it turns out, I also have a Coda bow and used to use Jade rosin too.